Some hermit crabs live only in the ocean. Land hermit crabs are born in the ocean, but leave as adults. Adult land hermit crabs return to the ocean only to reproduce. They are scavengers. In captivity, they can be fed commercial fish food or crab food as well as a variety of fruits and vegetables. Since land hermit crabs are hypoallergenic and easy to care for, they are popular pets. The Caribbean land hermit crab, also known as the purple pincher, is the most common land hermit crab available as a pet in North America. They are brown or reddish-brown with purple pincers, which give rise to their nickname. Caribbean hermit crabs are native to the Caribbean islands, as their name suggests, but can also be found in the Atlantic Ocean and the Gulf of Mexico. They require warm, humid air to survive. The Ecuadorian land hermit crab is also a common pet in the United States. They are native to the Pacific seashores of Ecuador and Chile. Despite being land-dwelling creatures, Ecuadorian hermit crabs need access to seawater at all times to live. Their eyes are thicker and not as round as those of their Caribbean cousins. Although usually tan, there are yellow, orange, blue and green Ecuadorian hermit crabs. They are also faster and more active than most hermit crabs. Sometimes known as the Crazy Crab, the Australian land hermit crab is native to the northern coast of Australia. Usually cream or pale brown in color, they may also have dark brown spots. 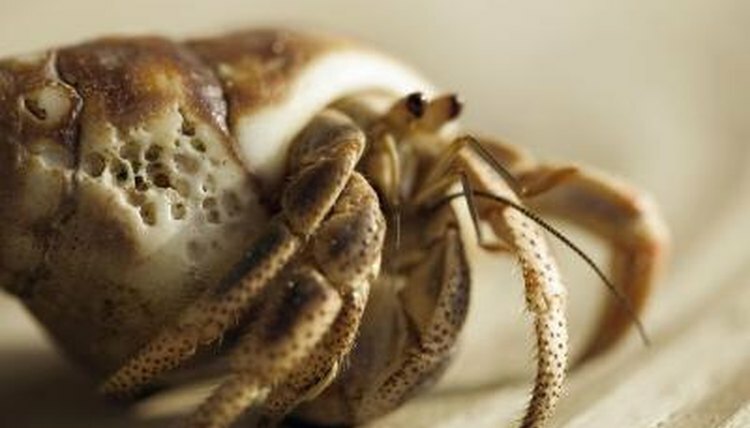 The “crazy crab” nickname came from the name of the first company to harvest them and sell them to people as pets. Once moving from the sea to dry land, they are found most often in mangroves and sometimes move far away from the beach. Strawberry land hermit crabs acquired their name from the bright red coloration of their legs and heads. They have thick walking legs and enjoy climbing. Strawberry crabs are found in the South Pacific and the Red Sea. A popular pet in Australia, they are restricted to the area around the Great Barrier Reef. Because they require high heat and humidity, they do not survive well in northern or Atlantic areas.